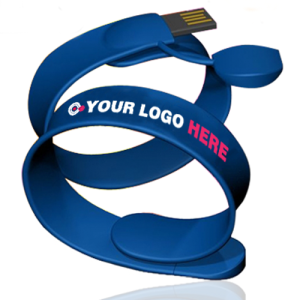 Keep your data safe, secure and easily accessible with our branded USB wristbands. They have been a huge success as a promotional gift at trade shows and are a big hit with on-the-go computer engineers. USB wristbands are also an ideal choice for students at school or college – no more fumbling around in a bag looking for that elusive memory stick. Wristbands are very popular with the youth demographic; they are fashionable and, the with the addition of a USB stick, practical souvenirs that also help to raise awareness of your brand. You can choose to have your data pre-loaded on to the flash drive within the wristband, for example sales documentation, images, music files, and so on. They could be used as part of an innovative solution for your next marketing campaign. Our USB wristbands can be branded with your own logo and other company details. We have two designs available: the slap on wristband is made from plastic and is available with a flash memory capacity of between 1GB and 16GB; the silicone wristband can have a memory capacity from 16MB to 16GB. Both are available in all colours, including the pantone matching system, so you can be sure that we can match your corporate colour scheme. USB wristbands come with a choice of packaging options to suit your method of distribution, including retail blister packs with or without bar code, cardboard gift boxes, or bulk poly bags. We specialise in bulk USBs drives and source our products directly from China to be able to offer our customers the best prices. Take a look at our USB wristbands below.